The end of the football season is nearly here, and yes while we will be a little bit sad that the end is nigh, everything is starting to get that little bit more exciting. Champions will be decided, teams will be faced with relegation, this is what football is all about. 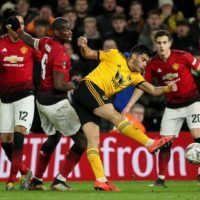 But today, we will take a step back from the pitch and check out the hottest boot spots this week of football had to offer. From boot switches to new boots and custom spots, this week had it all. Check out what caught our eye this week. It has been a half decent debut season in Chelsea colours for Cesc Fabregas. 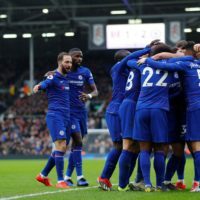 The Spaniard has played his part in what is shaping up to be a title winning season for Chelsea, something which was pushed home with Eden Hazard’s winner over Manchester United. 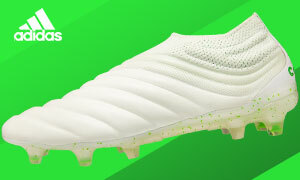 Cesc played the game in the all-new “Dragon” evoPOWER 1.2, which bears it’s name because of the awesome dragon-scale print and the Japanese word for ‘dragon’ on the heel (being half Japanese, I instantly approve of all that!). 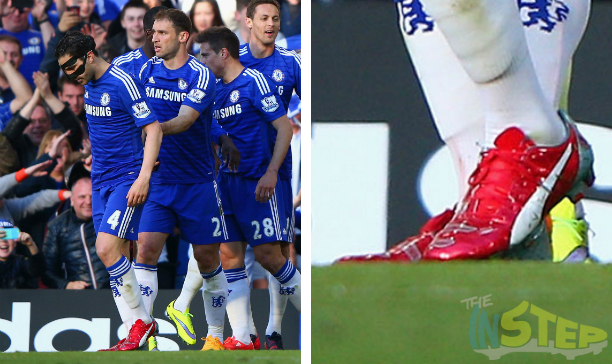 Cesc normally customises his boots with the sole plate from the Puma King, however we cannot tell if he has done that this time around. 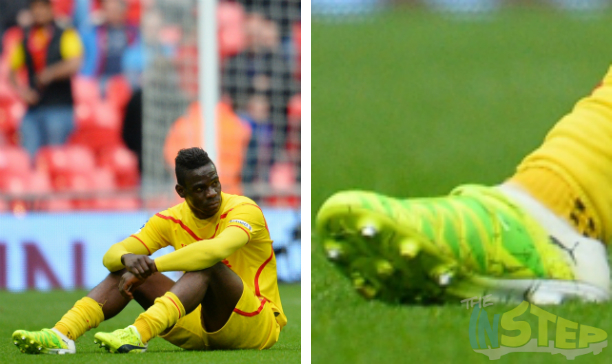 Players customising their boots with a black permanent marker is nothing new. 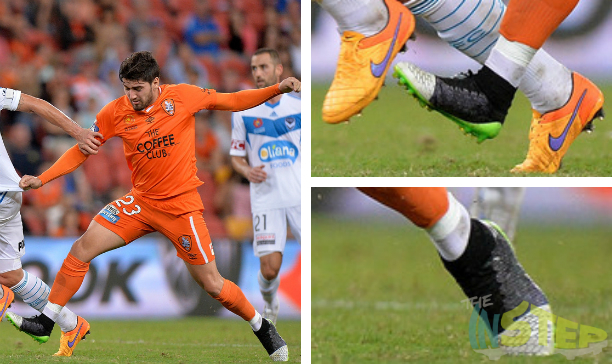 But the way in which Brisbane Roar’s Dimi Petratos has had his boots done up is something pretty different. The youngster has coloured about 75% of his boot, and from the distance it looks like the black section is an extension of the Dynamic Fit Collar. A strange customisation from the boy, but you know what I really thought the first time I saw the boots on TV? 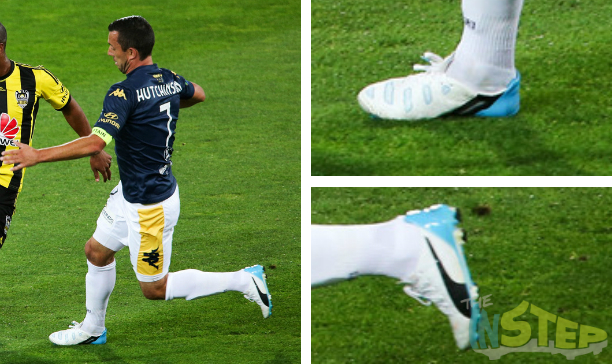 His boots really look like the Nike GS II, does anyone else see that? The F50 99g is the start of a new ‘Limited Release’ pack from adidas, and over the next few weeks you will see the boys and girls from the Three Stripes release a few limited edition boots that only the very fortunate are able to get a hold of. Next up will be a relaunch of the adidas Primeknit, which adidas have rather creatively called the Primeknit 2.0. 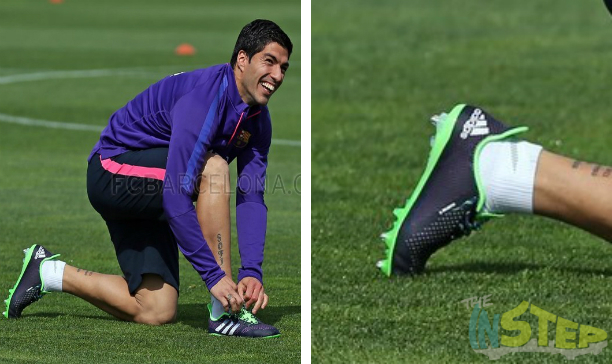 Just like last time, Luis Suarez will be given the honour of being the player to wear the boot to the masses, and he trained in the boots late last week with an expected debut sometime this week. The heel of the Primeknit 2.0 is certainly what sticks out to me, which is said to follow the shape of the foot for a more anatomical fit. Hmmm, I guess that kinda makes sense? It is amazing that when you just change one little thing on a general release boot, it instantly gives a whole new dimension to the boot. 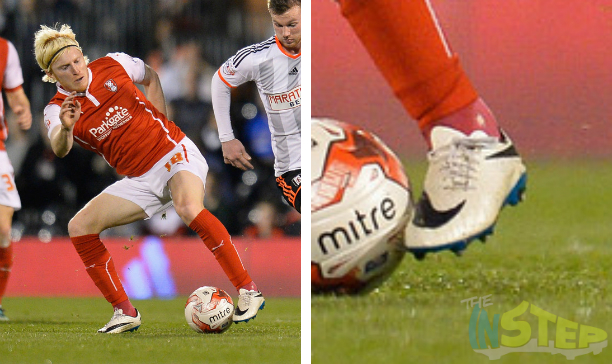 Take what Ben Pringle has done to his normal ‘Shine Pack’ Hypervenom Phantom, the Rotherham midfielder has coloured in the normally crimson coloured Nike tick with a black permanent marker. The result? A sharp white and black Hypervenom, finished off with a blue outsole. That is a classy football boot.